Since we have gotten quite a few questions concerning transmissions in recent weeks, we thought we would reprint a prior blog that could supply some answers to those questions. Your transmission is the one piece of equipment that is multi faceted. It controls everything from shifting your car from gear to gear, to controlling how fast your car goes. While you may never change out a transmission or spend time learning how it works, there are some tips to help you with transmission troubleshooting, so you will know when its time to call in a mechanic. 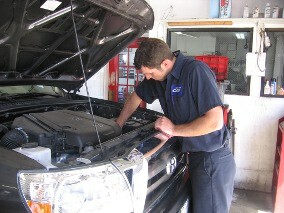 Low transmission fluid level, which causes your car to shift poorly and can eventually lead to transmission damage. Because of the many parts associated with a transmission, and the specialized tools you’ll need for troubleshooting and fixing it, its usually wise to leave it up to a professional. A professional understands what can be causing the problem, and can usually spot the problem quickly. They will test a variety of things before moving on to a rebuild or replacement.